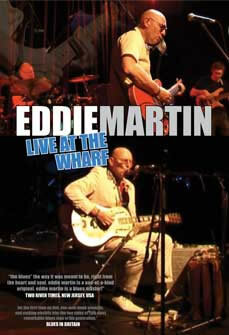 Eddie Martin s first DVD release shows live footage from one-man-band and band sets at one of the best venues on the international circuit, the Wharf Arts Centre, Tavistock. The dvd features a 20 minute solo set and 34 minute band set. The tracks feature favourites from his live shows and the odd surprise. For example, there is a previously unreleased song, “Let it Slide” in the band set which Eddie later rearranged and released as solo and big band tracks. The one man band song titles are “Someone’s Making Money” (and I know it isn’t me), “Little Queen of Spades”, “Shake Your Hips”, “One Man Band Rag”. In the band set there are extended live versions of “Early in the Morning” (Muddy Waters), Eddie’s own songs of “Let it Slide” and “Selfish Guy” – those three are all electric slide guitar, then he switches to his Gibson 335 for “Put the Brakes on” and “Cherry Red”. There is 54 minutes of music in all . 1. Someone’s making money (And I know it isn’t me).